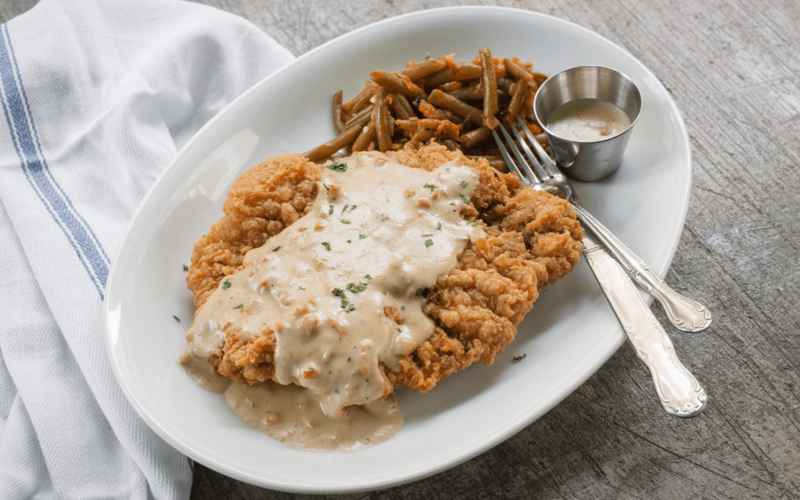 While the exact origins of chicken fried steak (CFS for short) are up for debate, it’s no secret that Texans have a strong affinity for this iconic slab of tenderized, batter-encrusted beef smothered in rich gravy. It is a beloved year-round staple in home kitchens and restaurants alike where time-honored recipes are revered by diners from all walks of life. In some ways, the hearty dish has shed its humble origins. Originally, it was a way to make cheap, tough cuts of beef more palatable and tender. These days, Houston chefs respect tradition but use it more as guidance rather than mandate. While some use less expensive cuts, others up the quality by breading steakhouse cuts and blending special spices into traditionally simple white gravies. Either way, chicken fried steak is a solid selection for those seeking a reasonably priced comfort meal. 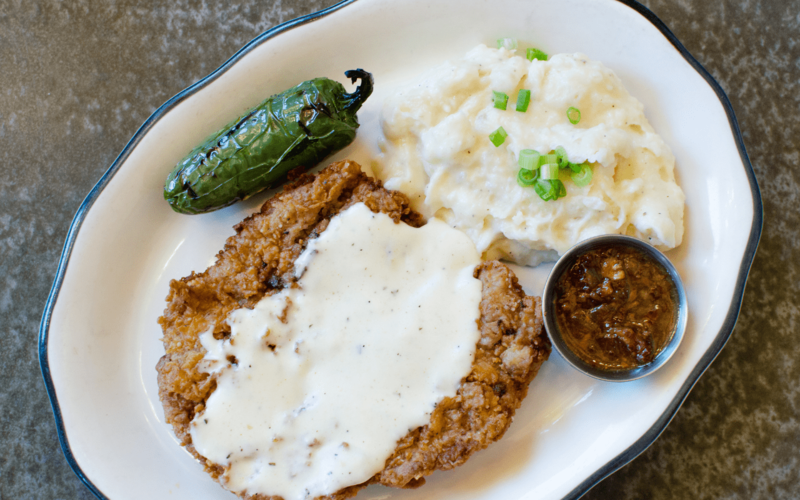 Want to taste the best chicken fried steaks in Houston? The following list is a great guide to the considerable number of excellent examples around town. 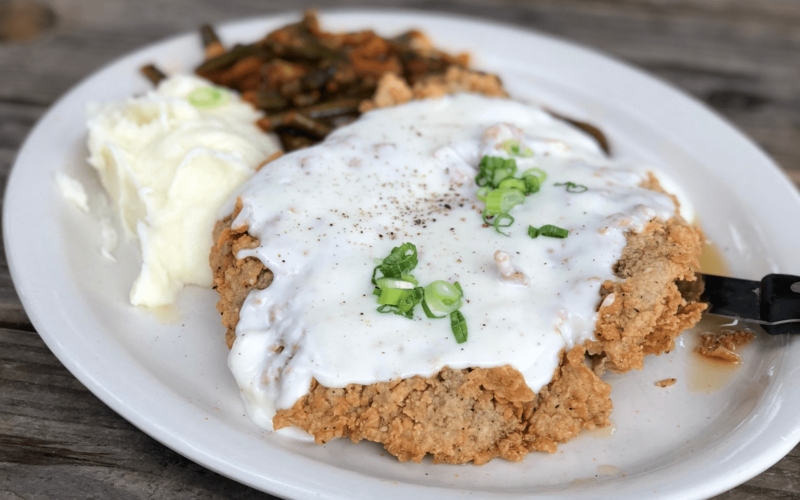 Chicken Fried Steak at Frank’s Americana Revival, 3736 Westheimer; $19 lunch, $25 at dinner: Michael Shine purchased Frank’s Chop House six years ago and gave it an updated name to reflect his intentions of serving elevated American classics. His sons serve as chef and sommelier, and the trio do a brisk business in Houston’s posh River Oaks neighborhood. 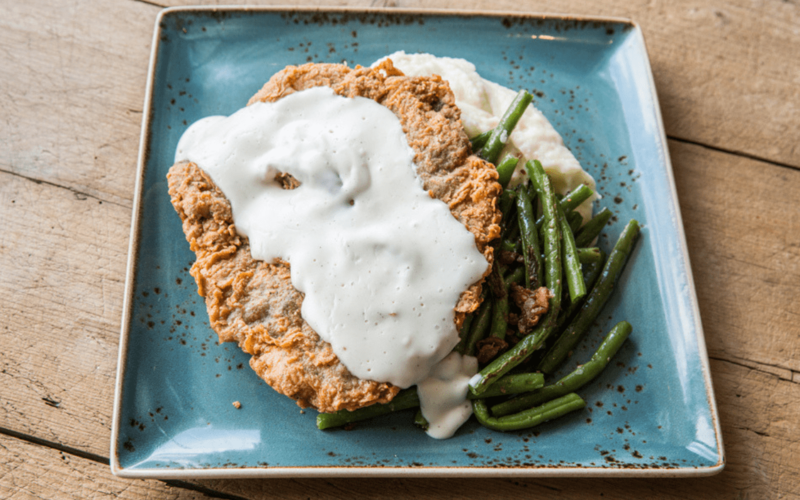 For Frank’s chicken fried steak, Shine got inspiration from the cuisines of the American southwest —in particular, chuck wagon heritage. He even has an authentic chuck wagon for special catering events where he serves the dish from a cast iron skillet. The chicken fried steak starts as an inch thick, 10-ounce cube steak from Wynn Meats in Fort Worth. It’s pounded until it’s a half-inch thick, oval-shaped steak. 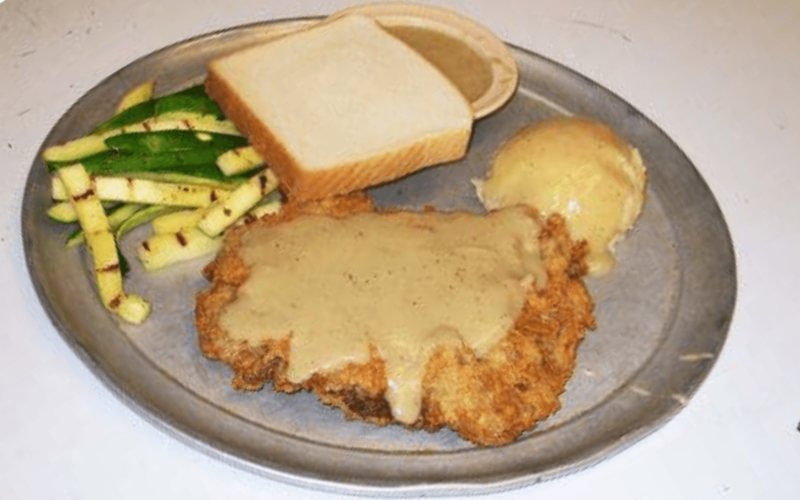 The fried steak is then covered with southern-style cracked black pepper cream gravy, which Shine says is a departure from true chuck wagon times when dairy was scarce and the gravy would have been more brown in color. Find it on the lunch menu with sides of roasted vegetables, mashed potatoes and gravy, or at dinner partnered with fresh garlic green beans, mashed potatoes and gravy. Diners can also request alternate sides like smoked gouda mac and cheese and grilled broccolini. Guests can order chicken-fried chicken prepared using the same recipe and even the chicken tenders on the kids’ menu get the same treatment. 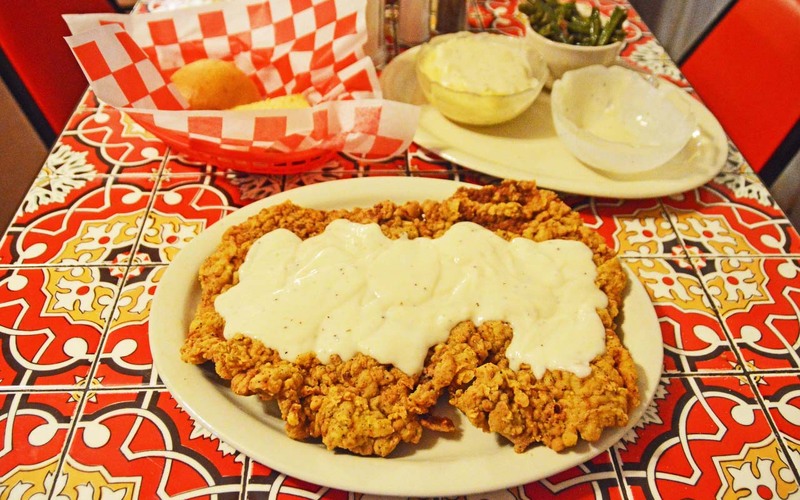 Chicken Fried Steak at Hickory Hollow, 8038 Fallbrook; $10.99 small, $13.59 medium, $15.99 large: This Texas comfort food haven opened in 1977 and has racked up accolades for essentials like chicken fried steak, barbecue and even ranch dressing. According to Joseph Boehm, general manager of the Heights location, the CFS began as the Rancher’s Meal in 1977 at the original Fallbrook location. This generously-sized dish features a 10-ounce steak — the restaurant’s largest choice. It also serves an eight-ounce called the Hired Hand and a five-ounce Ploughman. Each option comes with a choice of two sides from 11 options that include signature hot tots (jalapeño potato puffs), mashed potatoes to fried okra, green beans and mac ’n’ cheese. Hickory Hollow sources cube steak from Ruffino Meats in Bryan, Texas that arrives approximately three-eighths of an inch thick. Hickory Hollow avoids the white or brown gravy debate by serving Texas River Bottom Gravy that is neither traditional beef style nor cream-based. The recipe is closely guarded but Boehm says guests regularly ask for extra orders on the side for dipping. Note: Hickory Hollow will close its Heights location in early 2019, but the Fallbrook one is continuing on. Chicken Fried Steak at Jax Grill, 6510 South Rice; 1613 Shepherd; $10.95 plus tax: The first Jax Grill opened 25 years ago and to this day the original chicken fried steak recipe from July 28, 1993 is still used. Ditta Meats in Pasadena, Texas sizes the steaks to five-ounces and one-quarter-inch thick per the restaurant specifications and delivers the steak fresh daily. 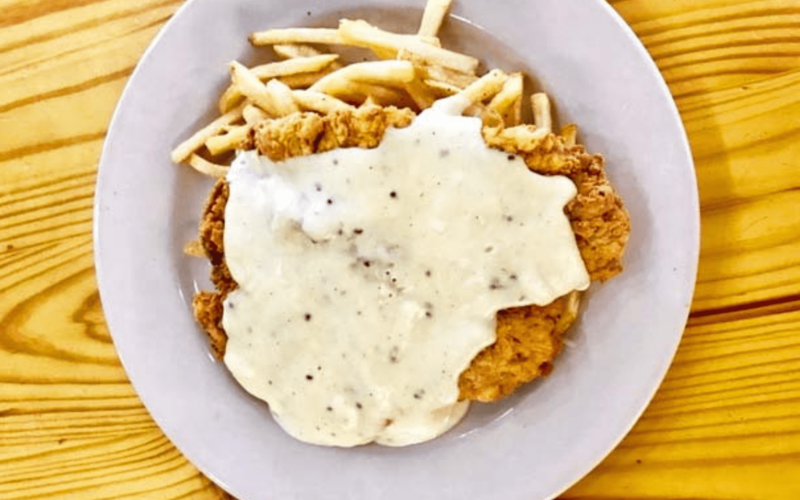 The white cream gravy is another 25-year-old specialty made in-house with butter, the seasoned chicken fried steak flour, milk, heavy cream, white pepper, black pepper, finely chopped white onions, fresh garlic, salt and chicken base. Jax Grill also offers chicken-fried chicken. Guests can choose from a range of sides and even order the CFS and CFC as sandwiches on toasted buns. Chicken Fried Prime Ribeye at Killen’s Barbecue, 3613 East Broadway, Pearland: Although barbecue is the primary draw at this Pearland locale, the chicken fried steak has a loyal following of its own. 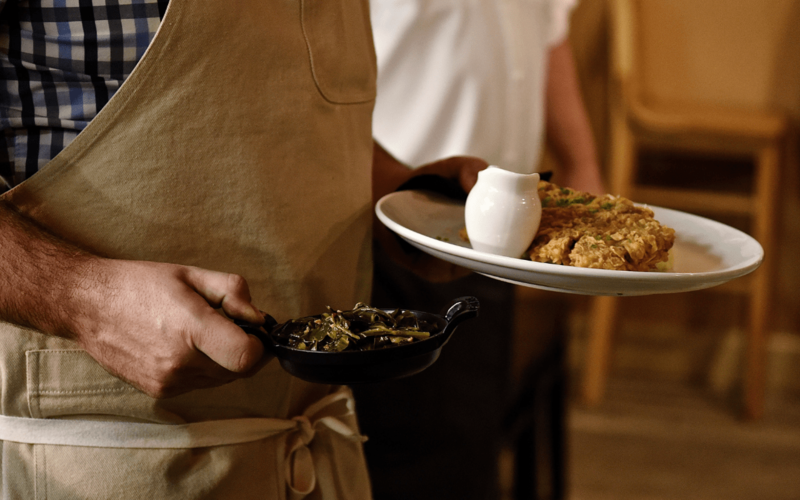 In fact, executive chef and owner Ronnie Killen has a chicken fried steak made with meat sourced from Snake River Farms at almost all of his restaurants, although the specific cut varies at each. At Killen’s Barbecue, it’s a prime rib eye for $22, a prime sirloin for the same price at Killen’s Steakhouse (6425 Broadway, Pearland) and a $32 buttery, prime wagyu ribeye at Killen’s STQ (his only Houston restaurant which is located at 2231 South Voss). 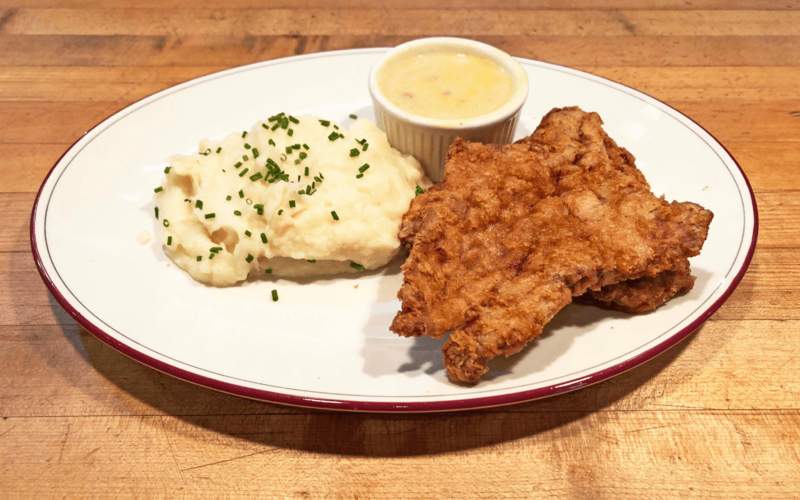 All of the chicken fried steaks are finished with a generous blanket of thick white cream gravy that’s fortified with bacon fat and studded with cracked black pepper. At Killen’s Barbecue, the CFS is available all day Tuesdays and dinner-only Wednesdays through Sundays. It’s accompanied by mashed potatoes and stewed green beans but diners have the option to swap in any two sides on the menu. Sides at Killen’s Steakhouse are mashed potatoes and haricot vert while the entrée at Killen’s STQ includes mashed potatoes and grilled broccolini. There’s a snack-sized option at Killen’s Steakhouse as well. The Chicken Fried Steak Bites are $12 at the bar during the weekday happy hour from 3:30 to close Mondays and Tuesdays and 3:30 to 6:30 the rest of the week. It’s a perfect use for the trimmed tenderloin pieces that are too small for an entrée. 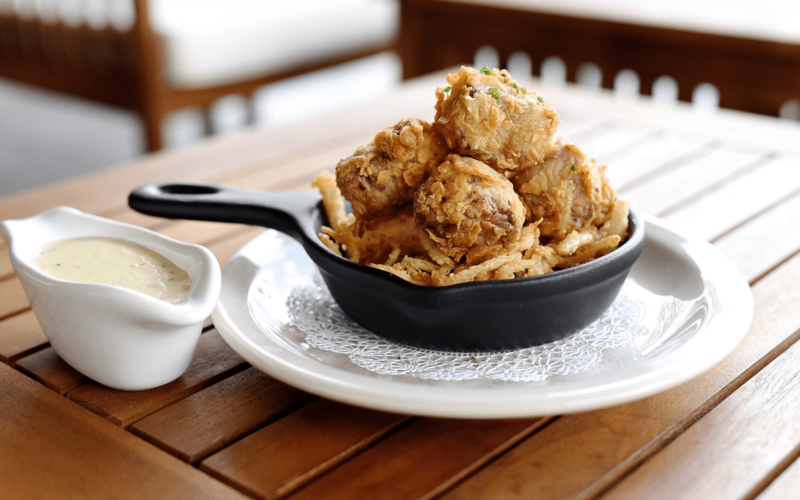 The shareable appetizer is served in a small cast iron skillet over a bed of crispy fried shoestring onions and accompanied by a brimming gravy boat so guests can dunk or drown their pieces according to their personal preferences. The Veal Chicken Fried Steak at Laurenzo’s Restaurant is accompanied by white cream gravy studded with sausage and pepperoni. Photo courtesy of Laurenzo’s Restaurant. Veal Chicken Fried Steak at Laurenzo’s Restaurant, 4412 Washington; $24.99: The menu at this Washington Corridor mainstay reads like a culinary family history album for the Laurenzo family, which also runs El Tiempo Cantina, El Tiempo Taqueria and Tony Mandola’s Gulf Coast Kitchen. There are sections for Italian, Mexican, and Texas-inspired dishes. However, the Veal Chicken Fried Steak is a newer addition. The decadent dish starts with a six- to eight-ounce cut of veal tenderloin pounded just enough to retain body and ensure crisp edges when fried. It is served with a family-recipe cream gravy that gets a twist with the addition of Italian sausage and pepperoni, whipped potatoes and brown gravy. Executive chef Donny Navarrete says guests can request variations and the restaurant does its best to accommodate those requests. 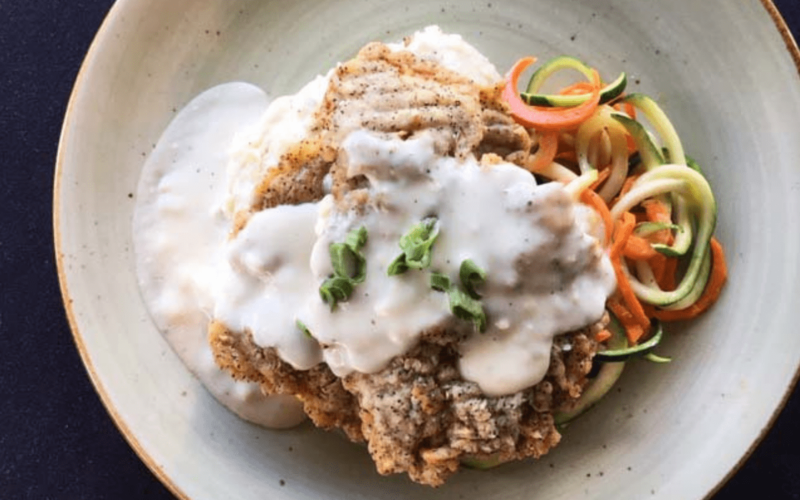 Chicken Fried Steak at Liberty Kitchen, multiple locations; $19.75 at dinner and $17 at brunch: According to culinary director Lance Fegen, the chicken fried steak served at all three Liberty Locations actually originated at now-closed BRC Gastropub. The recipe was developed to complement BRC’s extensive craft beer selection. The five-ounce Angus sirloin comes with two housemade gravy choices. The white is made with onion, butter, flour, bay leaf, thyme, milk and cream while the brown features butter, smoke-roasted mushrooms from the restaurant’s wood-fired grills, onion, roux and a dark beef broth. Diners can also go rogue and request chile con queso in lieu of gravy or mix up a custom combo of gravy and queso that Fegen says “is a dangerously good combination!” Traditionally, the restaurant serves sour cream mashed potatoes and buttered green peas as sides but guests can substitute for different ones, such as Brussel Sprouts & Bacon Jam, Heirloom Grits or a Modern Greens Salad. There is also a brunch version, the ½ Chicken Fried Steak & Eggs, which comes with two eggs, cream gravy, breakfast potatoes and housemade bacon jam. Chicken Fried Steak at Mel’s Country Cafe, 24814 Stanolind, Tomball; $11.75 to $17.99: It’s easy to feel at home in this family-owned cafe where photos of local youth sports teams brighten the walls and myriad Texas touches peek from nearly every shelf. In 1977, Charles Weirich Sr. and his wife Mary first opened their restaurant as a one-room hut called Mary’s Fried Chicken. In 1985 they renamed it Mel’s after their daughter Melody who, in turn, took over the space in 1994 and added the CFS. There are two sizes available at lunch and dinner: the large is 16 ounces and the small is eight ounces. A chicken fried chicken breast is also available for $10.75. Those looking to save a few bucks might get the Wednesday lunch special, a six-ounce CFS for $8.75. Each dinner entrée is served with both a housemade yeast roll and slab of sweet cornbread plus choice of two sides such as green beans, cole slaw, corn, fried okra, tater tots and mashed potatoes. Gravy choices include a cream-based black pepper white gravy or a brown gravy made from beef stock, roux and black pepper both of which are served on the side. Chicken Fried Steak at Punk’s Simple Southern Food, 5212 Morningside; $21: This traditional take on CFS at Punk’s uses an eight-ounce, half-inch thick cube steak flattened to a quarter-inch. It comes with cream gravy, — or brown, if requested — Punk’s signature horseradish mashed potatoes and Texas Toast. Alternate sides include collard greens, smokey black eyed peas, and macaroni and cheese. 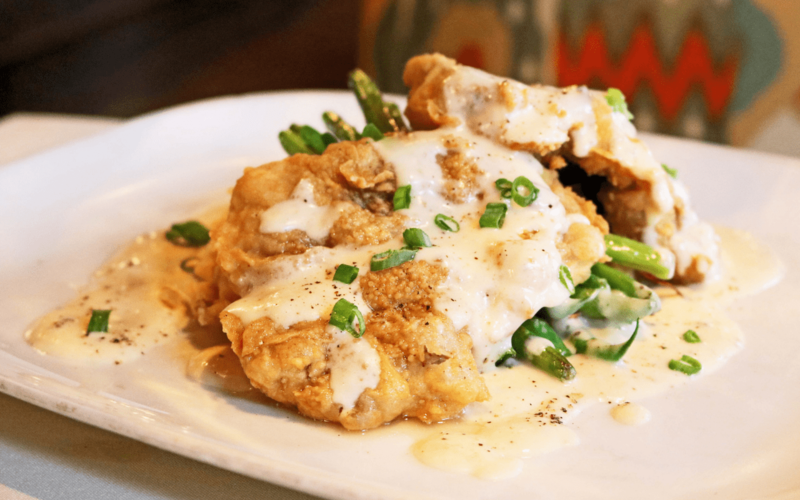 Chicken Fried Ribeye at State Fare Kitchen & Bar, 947 Gessner; $24: This casual-chic restaurant in Memorial City is popular for creative, scratch-made spins on Texas, Gulf Coast and southern comfort food. It features an eight-ounce, half-inch thick choice ribeye and battered with a blend of all-purpose flour, rice flour, wheat flour, cornstarch, garlic, onion and spices. According to a restaurant representative, the different types of flour used with the mixture of cornstarch give the crust a very crunchy texture. It’s topped with an East Texas-style white gravy that includes bacon fat cut with coffee. Brown gravy is available upon request. The sides are Idaho mashed potatoes and bacon-y green beans but can be swapped for other sides from the menu. Giant Chicken Fried Steak at The Hay Merchant, 1100 Westheimer; $43 for full, $21 for half: The massive CFS at The Hay Merchant is as Texas-sized as they come and while the “regular” size has been a staple since the restaurant opened, the “giant” size was added to the menu four years ago. It’s made with a 21-ounce 44 Farms black angus sirloin and crowned with white gravy made from roux, cream, salt, extra black pepper and Crystal hot sauce. It comes with two housemade biscuits and mashed potatoes. Side substitutions include fries and crisp vegetables with caramelized fish sauce. 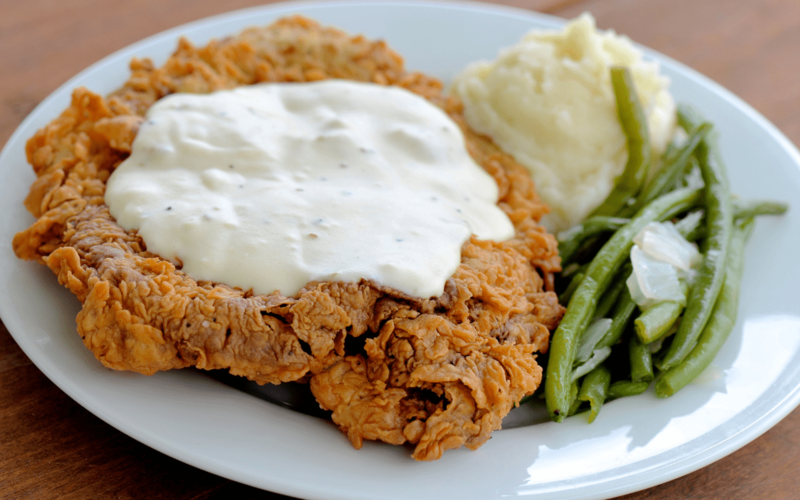 The Giant Chicken Fried Steak serves three to four people while the half-size serves one to two people. Both are available during lunch, dinner and weekend brunch. 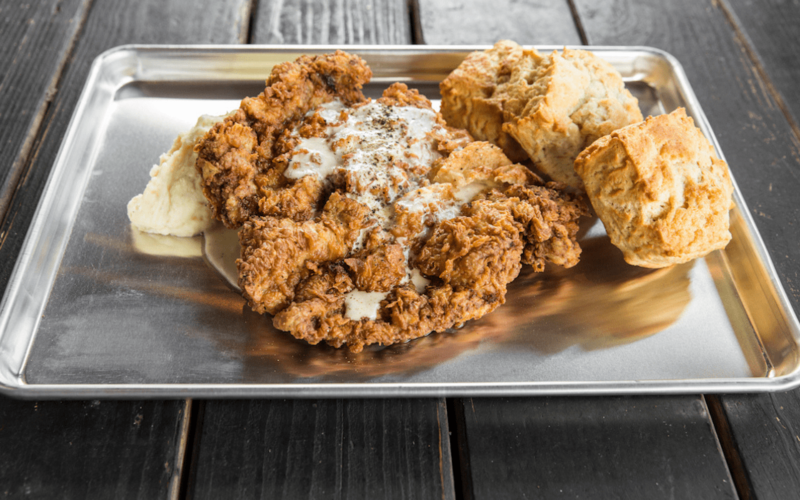 Country Fried Steak at The Union Kitchen, Multiple locations; $10.95: The Union Kitchen first opened in Bellaire and has grown to five locations throughout Houston. It added country fried steak to the all-day daily lunch menu eight years ago as well as a chicken fried chicken variation. It is made from a five-ounce, half-inch thick cube steak tenderized with a pin press. The golden brown steak is served with housemade white peppered gravy, mashed potatoes and mixed spiral cut zucchini, squash and carrots; alternative sides are available upon request. It also appears on the $14.50 Country Benedict that is available during weekend brunch. It’s made with a fresh-baked buttermilk biscuit topped with cheddar cheese, a fried egg and CFS finished with a garnish of fresh green onions. Chicken Fried Venison Cutlets at Rainbow Lodge, 2011 Ella; $19: No, we didn’t mistake deer for cattle but we also couldn’t pass up this alternative take at one of Houston’s most unique restaurants. 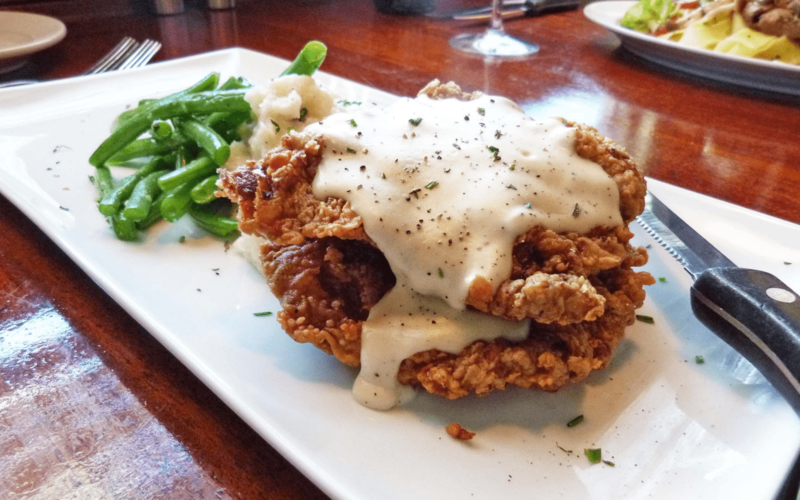 The Chicken Fried Venison is available at lunch and for Sunday brunch. As executive chef Mark Schmidt explains, “We are a [wild] game-centric restaurant and it’s the right version of CFS for us — plus it is delicious. For those who ‘fear the deer,’ it’s a safe and comfortable way to try game.” The kitchen receives twice-weekly deliveries of all-natural New Zealand venison, cuts it in-house and flattens it into six-ounce quarter-inch thick scallopinis each morning. It’s dredged and fried to order. It’s topped with black pepper cream gravy and Schmidt suggests adding a fried egg. Classic sides are mashed potatoes and green beans with shallots and black pepper gravy but the staff can accommodate guest requests for substitutions. 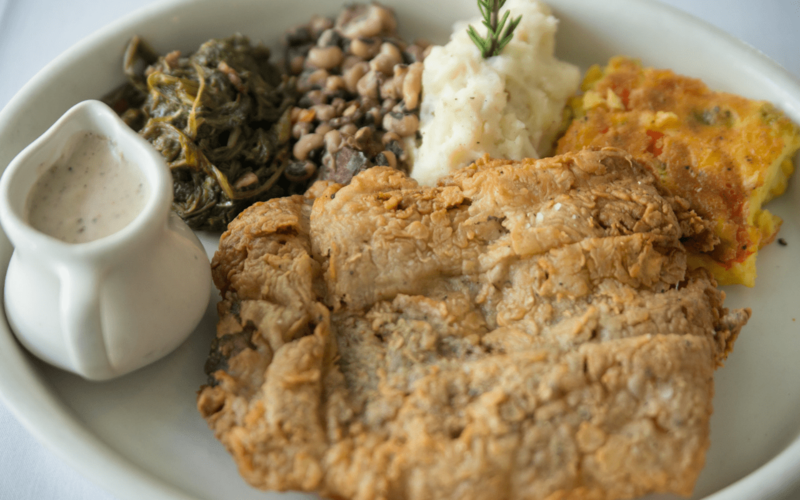 Purists can visit on the first Sunday every month for a $15 “old school” chicken fried steak during the restaurant’s weekly Sunday Supper. Did we overlook your favorite place for CFS? Let us know in the comments! Mia’s table has a fantastic CFS with the most delicious jalapeno cream gravy. Best one I’ve ever had! You forgot T Bone Toms in Kemah. Their CFS is a hidden gem. You obviously have not been to The Branch. Tell you what, go there and have their CFS and if you don’t agree that it is worthy of mention I’ll pay for that meal. Try their CFS & the H-town cheesesteak. Worthy.